Green Lane Masjid & Community Centre (GLMCC), is a mosque in Birmingham, linked to the Ahl-i Hadith Salafi movement. Established in the 1970s, it has been a registered charity in England since 2008. The Masjid occupies a prominent corner site in Green Lane, Small Heath, Birmingham. One of the buildings was originally constructed as a public library and baths, designed by local architects Martin & Chamberlain and built in the redbrick and terracotta Gothic-Jacobean style between 1893 and 1902. It is a Grade II listed building. The complex includes prayer halls for men and women, a community hall, madrasah, library, shop, and some accommodation. It also provides funeral services to the local Muslim community. In Birmingham, each year since 2011 there is an Eid al-Fitr celebration in Small Heath Park. This began as "an outdoor prayer facilitated by Green Lane Masjid and Community Centre." This was attended by 44,000 people in 2014, 60,000 in 2015, 88,000 in 2016 and 100,000 in 2017 and is organised by Green Lane Masjid and five other local mosques. It was also one of the mosques featured in Channel 4's 2007 Dispatches programme Undercover Mosque, which investigated religious extremism in British mosques, including preachers advocating violence, anti-Semitism, sexism, and homophobia. West Midlands Police subsequently carried out an investigation into whether criminal offenses had been committed by those preaching or teaching at the mosque. While West Midlands Police believed there was a case to answer and submitted their evidence to the CPS (Crown Prosecution Service), the CPS ruled that "a realistic prosecution was unlikely." The police subsequently investigated the programme itself and submitted a report to Ofcom on the basis of "unfair editing" designed to misrepresent the subjects of the programme. Ofcom ruled that there was no case to answer and that it was a "legitimate investigation." Both Channel 4 and the programme makers sued the CPS for libel, and settled for a payment of £100,000. In a 2007 national competition to find the country's 'Model Mosque' run by the British Islam Channel, the mosque came second, behind the Madni Jamia Masjid. In July 2011, the mosque hosted a number of controversial[how?] speakers at a 'Moments with the Messenger (SAW)' event, including Assim al-Hakeem, Abdur Raheem Green, Abu Usamah. ^ a b c "Green Lane Masjid". Muslims in Britain. 25 April 2015. Retrieved 4 June 2017. ^ "About Us". Green Lane Masjid. Archived from the original on 13 January 2008. Retrieved 13 September 2016. ^ Farquhar, Michael (16 November 2016). Circuits of Faith: Migration, Education, and the Wahhabi Mission. Stanford University Press. p. 163. ISBN 9781503600270. ^ "Registered charities in England and Wales, charity details: Green Lane Masjid And Community Centre". Charity Commission. Retrieved 9 April 2017. ^ Historic England. 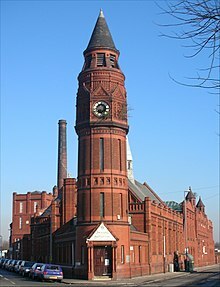 "Small Heath Public Library and Baths (217174)". Images of England. Retrieved 8 February 2008. ^ "Facilities". Green Lane Masjid. Archived from the original on 14 December 2007. Retrieved 8 February 2008. ^ a b c Cartledge, James (17 July 2015). "Pictures of Eid Small Heath Park celebrations involving estimated 60,000 people". Birmingham Mail. Retrieved 12 September 2016. ^ "Watch amazing aerial footage of Eid celebrations in Birmingham". Birmingham Mail. 6 July 2017. Retrieved 12 September 2016. ^ Morris, Steven. "Celebrate Eid: 60,000 enjoy end of Ramadan at event in Birmingham". the Guardian. Retrieved 10 October 2015. ^ Reporters, Telegraph (25 June 2017). "Largest Eid celebration in Europe as 100,000 Muslims gather in Birmingham". The Telegraph. ISSN 0307-1235. Retrieved 21 January 2018. ^ Sears, Nigel (9 August 2007). "Police accuse Channel 4 of distorting film on radical Muslim preachers". Daily Mail. Retrieved 12 September 2016. ^ "C4 'distorted' mosque programme". BBC news. 8 August 2007. Retrieved 12 September 2016. ^ "Mosque programme claims rejected". BBC news. 19 November 2007. Retrieved 12 September 2016. ^ "Police apologise over mosque show". BBC news. 15 May 2008. Retrieved 12 September 2016. ^ "Model Mosque 2007". Islam Channel. November 2007. Archived from the original on 24 September 2010. ^ "Madni Jamia Masjid has WON the Model Mosque 2007 competition!". ICEA - Islamic Cultural and Educational Centre. November 2007. Archived from the original on 18 September 2010. Wikimedia Commons has media related to Green Lane Masjid. This page was last edited on 23 January 2019, at 07:05 (UTC).